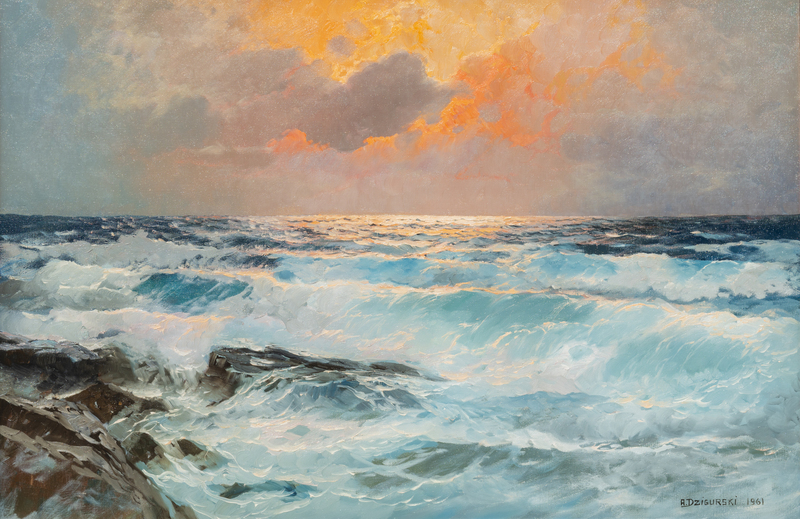 Alexander Dzigurski, who is known for his seascapes, landscapes, and some portraiture, is associated with the art of California, although he was born in the farming community of Backa, located in Stari Becej, then part of the Austro-Hungarian Empire. The son of a wheat farmer, he was one of four siblings. Alexander’s father considered his son’s artistic desires an unproductive pursuit; contrarily, his mother was most interested in her son’s talent, and understood her son’s wishes to extend his abilities beyond the farm. With assistance from the Serbian Church, he went to Belgrade, where he lived at the Rakovica Monastery and attended the School of Art. He painted portraits for private families and did restorations of old iconostases as means of support. After graduating at age 18 in 1929, he continued his studies at Munich’s Academy of Art. Then, for two years he volunteered in the King’s Navy (Kingdom of Yugoslavia) beginning in 1939. His experiences provided his first works of his sea paintings. After this military period, he married his high school sweetheart. A daughter was born in 1933, and he soon opened “Zograf”, his first studio. In 1941, Dzigurski was activated into the Yugoslav army, communications division. Several weeks later, Hitler’s army took most of his unit prisoner. Dzigurski managed to escape. Yugoslavia continued to be dissolved by the Germans, thus forcing Dzigurski to relinquish his successful studio and he departed to Italy. In 1949, the Dzigurski’s departed Naples and arrived in New York harbor aboard the “Marine Jumper”. His former Yugoslav professor introduced the family into the Serbian Orthodox Church community. Familiar with Alexander’s work, the Bishop had him paint icons (traditionally Byzantine) for a small memorial chapel in Pennsylvania. He would later be commissioned to paint the altars and interiors of nine Serbian Orthodox churches between 1951 and 1960. His beautiful works were not signed, remaining anonymous like most of the orthodox ecclesiastical painters before him. 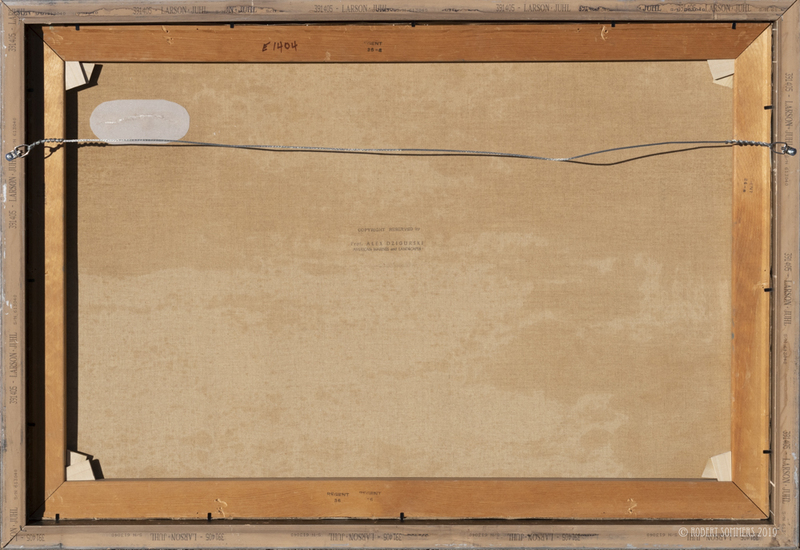 Dzigurski viewed his art as a sacred craft, excluding the intervention of human inventions. By about 1952, Alexander settled his family in California and began to paint seriously, particularly along the coastlines of northern California and Oregon. In 1968, a period of depression followed the death of his wife, and he lost interest in life and his painting. While recovering from a broken arm, however, Dzigurski became fond of, and married his nurse. Renewed optimism appeared with the birth of his son, Alexander Jr., spawning vigor that could be seen in subsequent works. 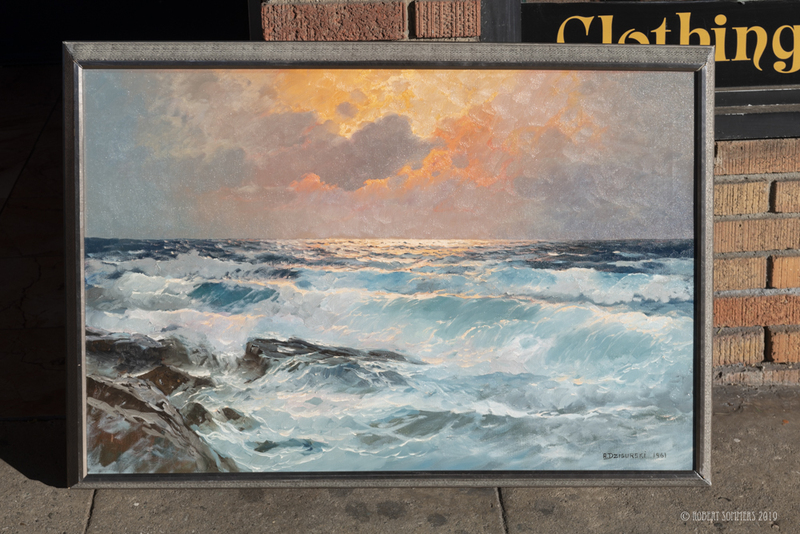 His seascapes and landscapes are most realistic and have broad appeal. His extensive US travel can be seen in his works from the Smokies, the Grand Tetons, Mt. Shasta, the Rockies, Glacier National Park, New England, and other coastal areas. His paintings can be found in the Franklin Mint Museum of American Art in Pennsylvania, the Republic Bank of Dallas, The Michigan Bank of Chicago, Illinois, the Ravenswood Bank of Chicago, Illinois, and at the Caterpillar Tractor Company in Peoria, Illinois. Having become one of America’s well-known artists, Alexander Dzigurski died in 1995.